Born in 1972 in Warsaw. A historian by profession and an essayist. Since 26th November 2015, she has acted as the General Conservator of Monuments. In 1996, she graduated from the History Institute at the University of Warsaw, receiving a Master’s Degree in History. She was employed at the History Institute at the Polish Academy of Sciences. In 2002, she completed her dissertation entitled “Racial Hygiene. The History of the Polish Eugenics Movement in 1880–1953” and obtained a Doctor’s Degree in Humanities in the field of History. 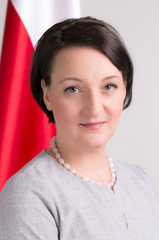 On 12 May 2016, she habilitated at the History Institute of the Polish Academy of Science with a dissertation entitled “The Dispute over Women’s Empowerment in 1864—1919”. In 2007—2008, she organized (in cooperation with Dr. S. Kuźma) a bilingual multimedia exhibition concerning the Polish and foreign eugenics movement entitled “The fight against racial degeneration” which was presented in an exhibition room at the University Library (April 2008). In 2012, she initiated the production of a documentary entitled “The death of a psychiatrist”, describing the suicide on 17th March 1940 of Dr. Karol Mikulski, who refused the German creation of a list of patients assigned for extermination. In 2013–2015, she started research on the course of the German occupation in northern Mazovia in the region of the Nazi extermination camp Treblinka and the prosecution of war crimes in the PRL. She was the initiator of the Witold Pilecki Centre for Totalitarian Studies. She has also participated in numerous research programmes and scientific conferences in Poland and abroad. Magdalena Gawin is an author of books (e.g. “Race and Modernity. The History of the Polish Eugenics Movement in 1880–1952” and “A Ticket to Modernity. About Culture in the 19th and 20th Centuries”), compilations, articles and interviews. Her texts have appeared in national and foreign, scientific, cultural, and socio-political journals, as well as in daily newspapers. She is married and has two children: Marysia and Adam.